ARLINGTON, Va. - Volunteers honored veterans buried at Arlington National Cemetery on Saturday with a massive effort to lay tens of thousands of holiday wreaths at their tombstones. Maine's Gov. Paul LePage and Sen. Olympia Snowe joined thousands of volunteers in placing the wreaths with red bows at the gravesites of about 90,000 veterans. 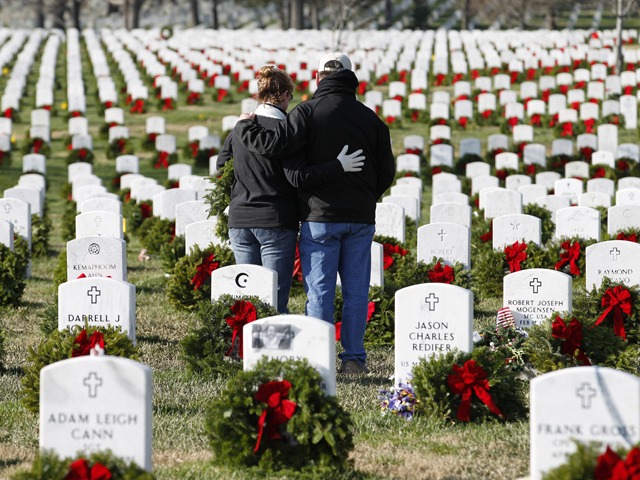 It was the most wreaths ever placed at the cemetery in a 20-year-old tradition. The most wreaths ever given in the past was 25,000, spokeswoman Amber Caron said. Organizers said they hoped to place 100,000 wreaths this year, but donations fell short of that goal. Still, the nonprofit group Wreaths Across America said they aim to honor every veteran at the cemetery by placing 220,000 wreaths there in the future. About 15,000 people joined the effort, Caron said. Within a few hours, all the wreaths were distributed across the large cemetery. "It was pretty incredible," she said. "We weren't expecting that many people ... we were really impressed." A convoy of more than 20 trucks left Maine last Sunday, bound for the cemetery just across the Potomac River from the nation's capital. The tradition began 20 years ago with little fanfare. Morrill Worcester, owner of Worcester Wreath Co. in Harrington, Maine, and others laid 5,000 wreaths on headstones that first year to give thanks to the nation's veterans. Since then, it has grown into its own organization with ceremonies across the country. The wreaths will remain in place at Arlington and on view until Jan. 28 when volunteers will return to remove them.